Has anyone had trouble with the A in this pack. bought it, love it, but a will not come up in jef or pes. Keeps saying no file or corrupt file all the rest of letters seem to work fine. Boo Hoo to me. I'd love to see this with letters about 4-5 inches high in size. Absolutely beautiful !!!!! Would look great on the outside of a spring jacket!!! And in answer to two questions. The letters are 2.32" high. They are all the same height. The width naturally varies by the letter as it would in any alphabet. I lOve it its AWSOME !! IM GETTING IT GOT TO HAVE IT ! 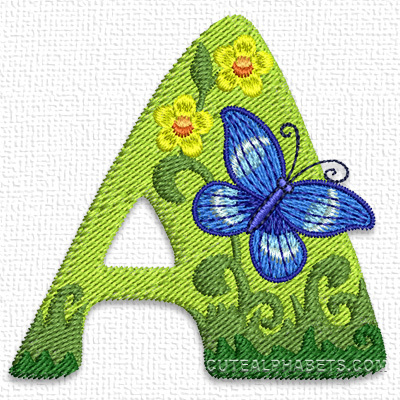 So cute-I wasn't going to order anymore, but I just love the colors and butterflies-can't wait to find time to stitch it out! Kinda pretty, but why aren't all the designs the same size?